"So far, we are unable to determine the cause of this massive outbreak of this invasive species, and researchers are working around the clock to identify these humanoid creatures with characteristics unlike anything we have come across before. 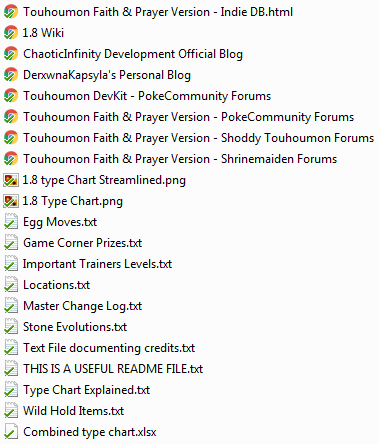 Until a conclusive answer can be achieved, we will refer to these creatures as..."
Touhoumon Faith & Prayer Version is an RPG Maker XP built fangame, based on Touhou Puppet Play 1.812's mechanics, using Pokemon Essentials as a base engine. As the project is in active development, you can expect to see the most relevant builds posted here when they go live. Always treat this page, as well as my blogs, as the primary sources for the game updates. Please do not reupload the game to other websites unless I have given the green-light. I most often will not, but it does not hurt to ask! Ultimately, this is to cut back on older versions being distributed, and thus buggy builds flying around. It will make all of our lives easier if you do it like this. I highly implore that everybody give this folder a glance at least once - though, preferably more than once! I've put a lot of work into documenting all the essential information for the game in a tidy and consice format. Though, perhaps you're more a fan of seeing them online. This is something I can give you! All you have to do is go >here< and you can view these documents in your browser! The internet sure is handy, isn't it? Pokemon also appear in the game! This is the only Touhoumon game to date to do something like this! Though they don't appear until later on, they will be obtainable, however not as prolific as Puppets are. The game, as mentioned above, utilizes Touhou Puppet Play Generation 1.8. What this means is better balance among the usable Puppets, and a fully diversified type chart. How the chart works is provided with the download. A Mystery Gift system! With this, you can get gifts that I hand out on occasion. There are some gifts that are permanent and can always be obtained, regardless of save file! Speaking of save files, the game also has a functioning Multi-Save System! Yes, you can have 900 saves for whatever reason you want! Do you like speed? Because I like speed. That's why I have included a Speed Button, which you can hold at any time and go at double speed! The key to activate it is "S"
There is less of a focus on becoming the Champion of the League, and more of a focus on the story. As such, most of the gyms are optional. Because gyms are optional, this means HMs become optional as well. Through a system I call "Exploration Items", the player can obtain several items which replicate the effects of the HMs, freeing up that slot in your party for Yet Another Waifu. Enhancements made by Agastya to Touhoumon Purple are more-or-less present in the game, so if that's your thing, hey now. A Pokemon World Tournament, which you can use to get some cool items! More tournaments are coming, as well as the remainder of the stock! ...And more stuff that I'm probably forgetting! Honestly, trying to remember every little unique detail is kinda hard! A significant amount of time has passed since Red, prodigal trainer of the Kanto Region, disbanded Team Rocket and became the Kanto League Champion. Between then and now, numerous events have happened. From the clash of the titans in the Hoenn Region, to the dimensional calamity in Sinnoh, as well as the Volcano Eruption and mudslide which shook Kanto fundamentally. And throughout all the hardships, people have risen up to combat these situations. The heroes of each regions, the common person. They persevered, they survived. Their resolve has been tested time nad time again, and they have proven that humanity is capable of surviving. Throughout the past eight years, peopele have grown stronger, and adapted to what was thrown at them. But even these trials were not enough to prepare them for what was to come - An invasion. Two years before the present day, Professor Oak, Professor of the Kanto Region, was assisting Professor Birch of the Hoenn Region with a task. Strange anomalies were being detected from deep within the Cave of Origin, a cave that is all but abandoned. With permission of the Sootopolis City Gym Leader, Oak and Birch began their expedition down to the depths of the Cave of Origin, and that was where they found... them. A creature, unlike any known Pokemon. Though classified as Pokemon at first, their genetic structure was far different than anything that had been discovered to date. While Oak and Birch took home some of the creatures for study, various parts of the world were reporting distressing news: "an invasion of an invasive species". These new species acted similarly to Pokemon, but were more aggressive. Their battles among themselves were much more powerful and destructive, and as a result Pokemon were being driven out of their natural habitats. The Pokemon went into hiding, while these new creatures began to dominate these spaces left open. It wasn't long before this "takeover" was complete, and the Pokemon of the world became a minority to this invasive breed. In the south, the Kikoto Adoption Agency shifted its gears into becoming a preservation complex, taking in Pokemon that had been displaced or harmed as a result. Open Adoption was closed to the public, and the entire island went into lockdown mode. Fortunately, the invasion wasn't occuring at all in the Kikoto Continent. A meeting of the minds was called, involving all walks of the Pokemon World. From Scientists to Gym Leaders, Professors and the Pokemon League itself, even representatives at the lowest level of the regional hierarchy, all gathered to discuss this growing situation. Several people advocated for driving this species back into hiding, others argued that since they weren't Pokemon that they should be taken apart to see how they function. It was a long and grueling debate, lasting months. There was't much headway made, not until Professor Oak chimed in that, though they are different species-wise, they act and function similar to Pokemon. He declared that treating these creatures as lower lifeforms would be a deplorable act. That we should treat these new creatures as a kindred lifeform, and should attempt to embrace this new situation. People tried to argue against it, though it was hard to talk down to one of the most respected people in the scientific community- especially when they were being backed by some of the more prominent people in the Pokemon world. Eventually, arguments started dying down, especially as more people began to side with Oak and his position. A decision was reached at that point - they would be treated the same way they would treat Pokemon, as equals, as partners, as friends. When the time came to decide upon what to call them, Professor Elm of the Johto Region chimed in with a suggestion that was unanimously recieved. "They look like humanoids, but aren't... Why don't we call them Puppets?" Two years have passed since the Puppet Invasion began. Two years have passed since the Puppet Protection Act was initialized. Two years have passed... and people have begun to adapt once more. The Puppets filled the void that the Pokemon left almost perfectly. Trainers captured them, they trained them, brought them to gyms and tournaments, entered them into contests, made them a part of their family. Puppets became the norm. Things returned to a peaceful state on the surface... However, the underworld is thriving once more. And factions from years passed have begun to move again. To them, they see the Puppets as an opertunity. An opertunity to fufill their wishes. A means to an end. And if left unchecked, the world could tip into their hands... But that just might not happen. And now, for the bug list! Boy oh boy, bug lists. - The game might be slightly inaccurate to 1.8 mechanics, and the way 1.8 stuff interacts with Pokemon stuff might be inaccurate. If you spot any inconsistencies I've seen, please point them out to me! - You might see a Black Void around the edge of some maps. While this doesn't break the game, it does look tacky. I am in the process of rectifying these, so if you notice any in the latest build please point them out to me! - Not really a bug but annoying; Some music tracks are too loud or quiet. I am in the process of adjusting the tracks so they're at a more uniform volume. - Some music tracks don't loop properly. If you spot one that doesn't, hit me up. - The credits only function properly when you're on the Medium screen size. Though the credits will be changed in the future, if you find the SECRET CREDITS event, this is so you know why it locks up. - Move animations basically don't exist. Unless you want to sign up for the project and make move animations for every single move, this is unlikely to be rectified for a long time. I suggest playing with animations disabled. It's very possible I missed some bugs in this list. If you notice any I forgot, relay them to me and I'll have throw them here and try to fix them if I can! As always, unless I specifically say otherwise on release, I suggest saving inside a house or a Pokemon Center. Changes have been, and will continue to be, made to outside maps to revise them. This page will probably get updated anytime there's been a release to the game, or when I need to release a Quick Patch. And I have a more official work Tumblr account that you can use to submit bug reports, as well as get more concrete news. I appreciate hearing from people, whether it's in regards to the game or anything, so don't hesitate to drop a message in my box! And what good thread is complete without videos! I've made quite a few videos that show off several things in the game, much better than simple screenshots can convey.